Category Archive for "Someone Bought This" | WrestleCrap – The Very Worst of Pro Wrestling! Obscure, strange, and sometimes downright horrible wrestling merchandise that someone paid good money to obtain. Someone Bought This: Steve Austin’s secret identity is finally revealed via this t-shirt! Someone Bought This: TNA Impact Pizza (and Drink!). Someone Bought This: WCW presents live online Pay-Per- (Buffering…). Someone Bought This: Ric Flair bought this! Someone Bought This: Finally! An action figure of an esteemed ex-President! Someone Bought This: Remember one of the worst main events ever with this shirt! 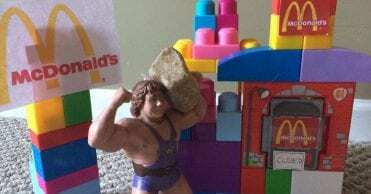 Someone MADE This: A child, Legos, and Ken Patera! Someone Bought This: The NWO talking Sting bop bag says really stupid things when you hit him! Someone Bought This: Paul E. Dangerously gets into the 4th Of July patriotic spirit! It Came From YouTube: UWF cookies! Someone Bought This: Menstrualmania is running wild (but only once a month). Someone Bought This: Sushi put through Hellfire and Brimstone! Someone Bought This: Don West- in photo form!